Dear people with hope: grace, mercy, and peace to you from God the Father and our Lord and Saviour Jesus Christ. Amen. “We had hoped that He was the One.” Those are the words of a broken heart. We had hoped that He was the One, but hope no longer. The hope of these two disciples on the road to Emmaus had been built up that Jesus would be their Saviour, but that hope had been crushed when Jesus died. They dared not get their hopes up again for fear of them being crushed again. These two disciples had been taught by Jesus. They had heard His preaching and seen His miracles. They had followed Him in the hope that He would redeem Israel and they might join Him in His glory. Their hearts sank, however, as they saw how He was treated so deplorably and nailed to the cross. Their hope was crushed as they saw His dead body laid into a grave. Even the report from the women that they had seen angels who said that Jesus was alive did not make them get their hopes up. They had quite likely also heard the rumours started by the bribed soldiers that the disciples had come and stolen the body of Jesus out of the grave, so they dared not get their hopes up again. They allowed their hope to fall. How did Jesus raise up their hopes again? He didn’t give them a motivational speech or tell them to think positive thoughts. He didn’t tell them to turn inward to their own thoughts and ideas. That’s what they were already doing and that’s why they were in hopeless despair. Jesus went to the Scriptures. Jesus pointed these disciples to the Scriptures that prophesied of His death and resurrection. He showed them how the Scriptures teach that it was in fact necessary that He die. He walked through the Scriptures, teaching them how they all point to Him. It was not a new idea or plan that Jesus would die. It was the plan from the beginning to save mankind. God had already told Adam and Eve about this plan when they fell into sin so that they would have hope. God continually sent prophets to His people to tell them concerning this plan of salvation so that His people would have hope. Here Jesus explains it to His disciples so that the disciples would have hope; that they would realize that this was God’s plan all along to save us; there is no victory or glory apart from the Saviour’s death. It would be very interesting to know which passages Jesus interpreted to the two disciples. The Old Testament Scriptures all point to Jesus, but we, like these disciples, often need some help in recognizing this. Take the prophecy to Adam and Eve. God said to the serpent or devil in the hearing of Adam and Eve, “I will put enmity between you and the woman, and between your offspring and her offspring; he shall bruise your head, and you shall bruise his heel.” (Gen. 3:15) This may not sound like the most significant prophecy at first hearing, but when it is interpreted, the Holy Spirit opens it up to us. The woman’s offspring is a child that would be born. Note that God does not say anything about the offspring of the man, but the woman. This was fulfilled in Jesus being born of the virgin Mary without a man. The serpent is the devil, and his head pertains to his power and might, specifically sin, death, and hell. Thus, the prophecy is saying that a child, the offspring of the woman, will take the devil’s might from him, so that he is no longer a mighty lord over sin and death, nor able to hold man under his dominion of sin, death, and hell. However, the serpent who is the devil would bruise the child’s heel, that is, torment and cause pain and death. This child would be true man, born of woman, but He would also have to be true God to have the power to defeat the devil. It then also follows, that being born of woman, He could also die, and indeed would die. Because He was promised to Adam and his descendants, to become man for our sakes and was sent by God for that reason, to rescue us from the effects of the Fall, it follows that He had to stand in our place and allow Himself to be tormented and killed for our sakes. But because He was to crush the devil, He could not remain in death but had to rise from death to eternal life, and by His resurrection begin to reign mightily in order also to bring His own who believe in Him from sin, death, and the devil to everlasting righteousness and life (this is summarized from Martin Luther’s sermon for Easter Monday). Or take the patriarch Joseph. His life was a prophetic type of Christ. As Jesus was betrayed by His close companion, so Joseph had been betrayed and sold by his own brothers into Egypt. As Jesus rose on the third day to rule mightily, so Joseph had risen to rule mightily in the third year. 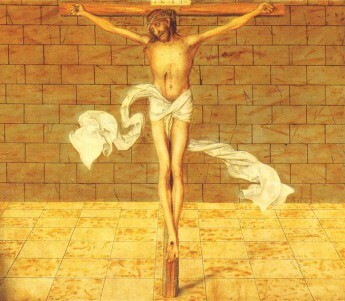 As Jesus was exalted out of the prison of death and did not make Himself immediately recognizable to His disciples, so Joseph, when exalted out of prison did not immediately make himself recognizable to his brothers, but instead presented himself as a stranger to them and spoke harshly to them (this is summarized from Johann Gerhard’s sermon for Easter Monday). The Bible is full of prophecy concerning the Christ and His work of salvation. That is why Jesus went to the Scriptures to comfort these disciples and lift up their hearts after they had let their hope fall. The Scriptures are also the only place for us to go when our hope falls. Forget motivational speeches and positive thoughts. Forget turning inward to your own thoughts and ideas. Turn to God’s Word, the holy Scriptures, for they tell of Christ and point to Christ. The Scriptures tell us not to despair or lose hope even in the face of death and hell. Our accuser, the devil, has had his head crushed by the promised offspring of Eve. Yes, the devil bruised Jesus’ heel, causing Him torment, pain, and death, but the promised offspring of the woman has taken the devil’s might from him, and he is no longer able to hold us under his dominion of sin, death, and hell. Hell is for the devil and his own, not for us. His accusations against the people of God will not be heard. When we are weak and have let our hope fall, Jesus does not forsake us or cast us aside. He comes to us in His Word and lifts up our hearts. He reminds us of His promises to us. Our sins are forgiven. He will never leave us or forsake us. Like a faithful shepherd, He goes after His lost sheep, and He does not give up until He has brought them back into the fold again. Through His Word, He will make our hearts burn within us with a faith that no hardships or seemingly hopeless situations can quench. He strengthens us as we recognize Him in the breaking of the bread in holy communion. Jesus will stay with us when it is toward evening, and the day is far spent. He will abide with us at the end of the day, at the end of our life, at the end of the world. He will abide with us with His grace and goodness, with His holy Word and Sacrament, with His strength and blessing. He will abide with us when the night of affliction and temptation comes upon us, the night of fear and despair, the night when death draws near. He will abide with us and with all the faithful, now and forever. Amen. Dear you who have not seen and yet have believed: grace, mercy, and peace to you from God the Father and our Lord and Saviour Jesus Christ. Amen. The Old Testament writings prophesy the resurrection of the Christ. The Psalmist writes that the Christ will not be abandoned in Sheol, the place of death, nor would His body see corruption, thus prophesying that Christ’s body would be raised and not remain in the grave to decay (Ps. 16:10). Jesus Himself prophesied His resurrection before His death, telling His disciples, “The Son of Man must suffer many things and be rejected by the elders and chief priests and scribes, and be killed, and on the third day be raised.” (Luke 9:22) Jesus told them this on many occasions. After Jesus’ resurrection, angels announced to the women at the tomb, and then Peter and John had seen the empty tomb for themselves. Jesus Himself had appeared to the women, who went and told the disciples that He was alive, but to the disciples, it seemed like an idle tale, and they did not believe them (Luke 24:11). The two disciples on the road to Emmaus had seen the risen Saviour, as had all those who were gathered in Emmaus when Jesus broke bread with them and gave them communion (Luke 24:13-35). Even the elders and chief priests had heard Jesus prophesy His resurrection. That’s why they went to Pilate after Jesus had died and said, “We remember how that imposter said, while He was still alive, ‘After three days I will rise.’” They thus requested a guard of soldiers to keep watch over the tomb to make sure Jesus’ body wouldn’t go anywhere (Matt. 27:62-66). The disciples had heard again and again that Jesus would rise from the dead, and then after the fact, that He had risen from the dead. They didn’t understand when they had heard it and they didn’t understand it after His death before they had seen Him alive. Even this was not enough for Thomas to believe. Thomas wanted proof. He wanted to see Jesus with His own eyes. He wanted to touch Jesus and see that He was real, and physically alive. By nature, we suffer from this same spiritual blindness. By nature, we do not want to believe anything that we have not seen with our own eyes. We’ve never seen God punish sin, so we don’t want to believe that He ever does, that He ever has, or that He ever will. We don’t see the demons behind the ways of the world, so we don’t want to believe that they exist or that there is anything wrong with living like the world. We do not see the Bible as being the Word of God, so we neglect it, don’t read it, do our best to not listen to it when it is read, and have no idea what it says, instead coming up with our own ideas of what God wants and doesn’t want. Repent. If your faith is based on what you see, what you feel, and what you touch, you’re doomed to hell. If you scoff at what the Bible says, because you don’t even know what it says, you’re doomed to hell. If you think calls to repentance are an idle tale, you’re doomed to hell. Repent. Just as Jesus did not leave His disciples in their blindness, so He does not leave us in our blindness. To the disciples, including Thomas, He showed His hands and His side. Jesus showing them His hands and His side did not make Him any more alive than He was before He proved Himself to be alive. He was alive whether the disciples believed it or not. He was alive whether the disciples saw Him or not. But He showed Himself alive so that they would not only believe themselves, but that they might also bear witness about Jesus’ resurrection to others. Thus, Jesus does not leave us in our blindness. He has given us multiple records of His life, death, and resurrection, so that we would believe. He has sent and continues to send ministers of His Word to proclaim repentance, His resurrection, and to forgive and withhold forgiveness in His name. Do not disbelieve, but believe. This belief, or faith, changes us. It changed the disciples from being cowards in fear of the Jews and hiding behind locked doors to going out and openly proclaiming the Word of Jesus. Peter and the other apostles, hauled before the same council that had put Jesus to death, did not cower in fear. They point blank accused the council of murdering Jesus saying, “The God of our fathers raised Jesus, whom you killed by hanging Him on a tree.” When ordered by the council to stop teaching in the name of Jesus, they said, “We must obey God rather than men.” When they were taken by the council and physically beaten for teaching God’s Word, they rejoiced that they were counted worthy to suffer dishonour for Jesus’ name. The disciples were completely different men than those who hid behind locked doors out of fear. They were changed because they no longer believed that Jesus was dead, but that He was alive. So also Jesus’ resurrection changes us, if we believe. A believer is changed because he does not live in unrepentance like Jesus is still in the grave. A believer is changed because he does not scoff at Jesus Word like it is idle tales. A believer is changed because he does not cower in fear over His sins like Jesus is still dead. Whether we believe or not does not change the fact that Jesus is risen from the dead. Whether we repent or not does not change the fact that Jesus is risen from the dead. Our repentance and faith only affect whether or not we have life in His name, and Jesus has specifically given us His Word so that we would repent and believe, and live forever. Notice the mercy Jesus shows to the disciples. Jesus had sent the disciples to proclaim His death and resurrection, and to absolve sins but they hadn’t gone. Eight days later, they were still hiding behind locked doors. Jesus appeared again to them behind locked doors and gave them His peace, absolving their sin, absolving their fear. This is the same mercy Jesus shows to you. Jesus absolves your sin, but you again struggle with it and fall back into it. So Jesus comes again into the locked doors of your heart and gives you His peace and absolves you of your sin. He breaks the bonds of sin that bind you by leading you to repentance and again forgiving you your sin. He gives you His Word in which His life, death, and resurrection are recorded, so that you may believe and have life in His name. He absolves you again and again because you sin again and again, but He’s not tabulating how many times He forgives you or how often. Jesus is merciful, so He just forgives you. He gives you His body and blood to eat and drink so that you would be strengthened to everlasting life, not so that you would remain impenitently in sin. Jesus’ resurrection changes everyone who believes because believers no longer live for themselves, but for Christ, in whose resurrection we have the promise of our resurrection. Jesus’ resurrection changes everyone who believes because we no longer have to fear hell because we have the promise of eternal life. Jesus’ resurrection changes everyone who believes, because in His Word He promises that we have life in His name. In His Word He promises, “Blessed are those who have not seen and yet have believed.” Amen. Dear victors over death: grace, mercy, and peace to you from God the Father and our Lord and Saviour Jesus Christ. Amen. The women who went to the tomb hadn’t really thought things through. Early on Sunday morning while it was still dark, they headed to the tomb where they had seen Jesus’ lifeless body laid with their own eyes. They went with spices to prepare Jesus’ body for permanent burial. These women had some impediments to accomplishing their task, however. There was a great stone in front of the entrance of the tomb. That great stone was sealed so that it would not be moved. Further, Pilate had given the Jews a guard of soldiers to keep the tomb as secure as possible. The greatest impediment of all, of course, was the fact that Jesus was not in the tomb and He was no longer dead. The great stone was guarding an empty tomb. The seal, still secure in its place, gave no evidence of the fact that Jesus was no longer there. The guards were securing nothing more than grave cloths in an otherwise vacant grave. The great stone, the seal, and the guards were no impediment for Jesus to rise from the dead. The angel makes a show of this, mocking such pathetic attempts to keep Jesus in the grave. The angel caused a great earthquake. Why? He could have moved the stone without an earthquake. The angel’s appearance was like lightning, and his clothing white as snow. Why? Oftentimes, angels would appear looking like regular men. He made the guards become like dead men, like they were nothing. Why? They were no threat to him. He sat on the stone he had rolled away. Why? He wasn’t tired. He didn’t need to sit down to rest. He sat on the stone for the same reason he did all the other spectacular things. He did it to mock these insignificant, pathetic attempts to keep Jesus in the grave. This tiny little rock is going to keep Jesus in the tomb? This joke of a seal is supposed to do something? Those soldiers that are like dead men are supposed to secure something? That’s laughable! Even more, the angel mocks death. Is that all you got? Is that your best shot? O grave, where is your victory? You swallowed up the Son of God, the one who laid the earth’s foundations. You took the life of the one on whom all the sins of the world were laid. Is that your victory? No, that is no victory. As the angel shows, the grave is empty. The grave could not hold its prey. Because Jesus had all of our sins on Him, and because He died for us and in our place, and because He rose from the dead, the grave will have no victory when we die either. Death has lost its strength and power. Death can threaten all it likes. It can try to intimidate with illness and disease, with accidents and catastrophes, but death is impotent. Death can threaten as our bodies fail, as we grow weak and tired, and as we suffer loneliness and depression. But the angel mocks you, o death. The angel makes a spectacle of how powerless and pathetic you are. We join the angel. We mock you, o death. Is that all you got? Is that your best shot? O grave, where is your victory? Where is your sting? You are powerless and pathetic. We will die, but that is no victory for the grave. No great stones or seals or guards of soldiers will keep us in the grave any more than they kept Jesus in the grave. Our sins will not keep us in the grave. Our sins were put on Jesus, Jesus died for them, and He rose from the dead. Our sins have been removed from us. They’ve been taken away by the Lamb of God and they are no longer ours. Our tombs will be empty, like Jesus’ tomb is empty. Then we will have a real spectacle as all who died in Christ are raised to eternal life. We will see all the sights and sounds of heaven in their spectacular glory, and be with our risen Lord for eternity. Christ has taken away all the impediments that would stand in the way of our eternal life. He has given us His Word of truth which keeps us from following the lies of the devil, the world, and our sinful flesh. He has called us as His own through the waters of Holy Baptism, and thus separated us from the hosts of unbelievers. He gives us His resurrected body and blood to eat and drink so that we will live forever as He lives forever. So, yes, we mock death. Death is now for us nothing more than a slumber from which Christ will awaken us on the Last Day. When we die, then we will really be alive with Jesus, while our bodies sleep, waiting for the day of resurrection. We go through death only to follow Jesus out of death, victorious because Jesus has given us victory over death. Jesus’ death has swallowed up death. Death has lost its sting forever. So, it doesn’t matter what or who is guarding our tombs on the day of resurrection, because we won’t be there. Our graves will be empty because Jesus grave is empty. Amen. God responds to sin with anger, wrath, and punishment. Sin makes God angry enough to destroy the whole earth with a flood, to rain sulphur and fire out of heaven destroying cities, and to bring plague, famine, war, bloodshed, and exile, even on His own people who have turned away from Him. God responds to sin in His wrath, saying, “Your dead bodies shall fall in the wilderness… not one shall come into the land where I swore that I would make you dwell,” and “I myself will fight against you with outstretched hand and strong arm, in anger and in fury and in great wrath.” God responds to sin with punishment; punishment that He pours out upon the children in the street, the young and the old, as their houses and fields are taken by others, along with their wives; punishment that is so horrible that people will wish for death by mountains falling on them and hills covering them. This is no exaggeration or hyperbole. This is what God tells us in His own Word. The wrath of God is no trivial or small thing. God hates sin and threatens to punish the sinner to the third and fourth generation of those who hate Him. We can pretend He’s not threatening us, but He is. We can pretend our sin is not such a big deal, but it is. We can pretend God is not angry over our sin, but He is. Our sin deserves the anger of God to be unleashed on us. Our sin deserves the wrath of God to be poured upon us. Our sin deserves the punishment of God both here in time, and eternally in hell. God responds to sin with anger, wrath, and punishment. Sin made God angry enough to forsake His only Son and give Him up to death. Good Friday reveals the wrath of God, as God the Father cast His righteous wrath and His just punishment upon Jesus on our behalf. Jesus suffered to the point that He was so marred that He was beyond human semblance. He was despised and rejected by men and by God the Father. He was stricken, smitten by God, and afflicted. It was the will of the Lord to crush Him and put Him to grief. The Lord laid on Jesus the iniquity of us all. This was not God showing love to people that are pretty good and needing just a little bit of help. This was God showing love to people who are by nature children of wrath and His enemies. This was God giving His Son unto death for rebels who hated Him and killed Him, choosing the murderer and insurrectionist Barabbas over Him. This was God sacrificing His own perfect Son for those who have chosen darkness over light, death over life, and Satan over Jesus. Good Friday is God punishing Jesus for our sins instead of punishing us. Good Friday is God pouring His anger, wrath, and punishment on Jesus, who did not deserve it, instead of on us, who do deserve it. As much as you might love someone, you would never sacrifice your son to die for them. Neither would I. This is even more true if it is someone who has shown you nothing but hatred and contempt, and done everything possible to hurt you and harm your family and possessions, and no matter what they’ve done against you they say they haven’t done anything wrong. Yet, it was exactly for such people full of hatred and contempt that God sent His only Son to die; such people blind to their own sin and full of self-righteousness. God has no desire to punish the wicked. Rather, He wants the wicked to turn from his evil ways and live. That is why God punished His own Son, so that we would be spared eternal punishment. Good Friday was for us. Christ has borne our griefs and carried our sorrows. He was wounded for our transgressions. He was crushed for our iniquities. Upon Him was the chastisement that brought us peace. With His stripes we are healed. It was all for us and our salvation. Christ suffered everything for us and in our place, so that we would receive eternal life. Christ still does everything for us. He makes intercession for us transgressors, praying for us. He sprinkles many nations with the Baptismal waters of forgiveness, that blessed flood and lavish washing away of sin. He fills our chalice with His blood which flowed forth for our sins. Every Sunday He gives us the medicine of eternal life. This is no exaggeration or hyperbole. The love of God is no trivial or small thing. The love of God is so great that it covers His anger. Not because sin is a trivial or small thing, but because He has already punished all sin in Jesus. Jesus’ payment of His holy precious blood and His innocent suffering and death have turned away God’s anger, wrath, and punishment from us. Not so that we would return to our rebellious ways of darkness and death, taking His Word and gifts for granted, but rather so that we would live like His children, read and hear His Word, and continuously receive His gifts. Good Friday is about the wrath of God, and how Jesus’ death has turned it away from us. As we anticipate the great joys of Easter and the resurrection of our Lord, we can anticipate the great joys of our own resurrection, when we will rise from the dead and live eternally. We will live eternally because God’s anger has been turned away from us, so we have no punishment to fear. On Good Friday, Jesus took all the anger, wrath, and punishment that we deserve, so we receive all that is His and share in His inheritance of eternal life. Amen. Dear people in communion with Christ: grace, mercy, and peace to you from God the Father and our Lord and Saviour Jesus Christ. Amen. The true Christian church, or God’s holy people, is recognized by the Sacrament of the Altar. Wherever it is rightly given, believed, and received according to Christ’s institution, there God’s holy people are. The Sacrament of the Altar is a public mark by which God’s people are made holy through the forgiveness of sins and nourished with the body and blood of Jesus which strengthen faith. The Sacrament of the Altar is then the seventh and final mark of the holy Christian church. Wherever you see this Sacrament as Christ instituted it, know that the Christian holy people must certainly be there. As with all the marks of the church, note the qualifying words. Not just any supper is the Lord’s Supper. Not just any supper is a mark of the church. The Supper instituted by Christ and rightly given, believed, and received according to Christ’s institution is a mark of the true church. For His Supper, Christ did not institute a private mass for one priest to perform on behalf of the dead. Christ did not institute a sacrifice where His body and blood are offered to God over and over by a priest. Christ did not institute a free-for-all with crackers and grape juice that’s open to everyone or Corpus Christi parades where they parade around with the communion elements as if people benefit just from looking at them. The church in Corinth thought that it was not a big deal to change around the institution of Christ in the Sacrament of the Altar. This resulted in people eating and drinking in an unworthy manner. It resulted in them being guilty concerning the body and blood of the Lord, eating and drinking judgment on themselves, and being punished by God with weakness, illness, and death (I Cor. 11:27-30). Why did God deal so harshly with them? So that they would not be condemned with the world (I Cor. 11:32). God was disciplining them so that they would repent and not go to hell. Further, if you are not repentant of your sins, you eat in an unworthy manner and will be guilty concerning the body and blood of Christ (I Cor. 11:27). Those who are not sorry for their sins do not and cannot receive forgiveness of sins. Those who have no desire to change their sinful lives with the help of the Holy Spirit do not and cannot receive forgiveness of sins. For these reasons, the Christian church has always practiced closed communion. Out of love for those who do not believe Christ’s words or are openly ungodly and unrepentant, the church is not to commune them. It is not loving to give someone something that you know will harm them. It’s not loving to commune someone to his judgment. This is not just a congregational policy or a policy of our synod, but it is God’s command. We follow Christ’s commands concerning His Supper. The question then is, how can the church practice closed communion, since we cannot examine someone else’s heart? How can we exclude the ungodly, unrepentant man who does not believe Christ’s words in the Sacrament if we cannot see his heart? The answer is by his public confession. The clearest confession of what a man believes is belonging to a particular church. When someone is a member at a church, he confesses that he believes what is taught at the church. In order for you to believe what is taught at the church, instruction such as confirmation is necessary. Then, the man publicly confesses before the church that this is what he believes, and we take him at his word. If someone is a member at a church of a different confession, then we must also take him at his word that he believes what that church teaches. If he belongs to a church that rejects some parts of holy Scripture, then we must take him at his word that he also rejects those same parts of Scripture. Now, it is possible that someone belongs to a church without realizing that his church teaches falsely. Many false teaching churches hide their denial of God’s Word. We should pray for those Christians who belong to such churches, and commend them to God who works through His Word. We pray that they would drink the pure living water of His Word and not become poisoned by the false teaching of their church. But we must assume that their public confession matches the public confession of their church. We can assume that if only they knew the false teaching that they were hearing, they would quickly flee to a church that teaches the pure Word of God. But we must assume that their public confession is the same as their church’s. We cannot judge hearts and minds. We can only determine someone’s faith by his public confession. In addition to one’s membership in a church is the outward living of a man. If a man lives contrary to God’s Word, not through weakness but through a refusal to amend his life according to God’s Word, we must assume that he doesn’t believe God’s word of forgiveness and newness of life. Such a man shows by his refusal to repent that he does not desire the very forgiveness of sins that is offered in the Lord’s Supper. Therefore, we must conclude that he would receive the Lord’s Supper in an unworthy manner. To allow such a man to sin against the body and blood of Christ is far from loving. It is a hateful thing to knowingly give someone poison. Such would be the case if we were to give the Lord’s Supper to one who through his public confession denies God’s Word. So, do you have to be scared about receiving the Lord’s Supper in an unworthy manner? How can you be certain that you receive it for your good? This is where examining yourself comes in. In preparation to receive the Sacrament of the Altar, examine yourself to see whether you are sorry for your sins and desire with the help of the Holy Spirit to amend your sinful life. Examine yourself whether you believe in our Saviour Jesus Christ and His words in the Sacrament: “This is my body… this is my blood… for the forgiveness of sins.” (Matt. 26:26-28) He who believes in the Word of God that Christ offers Himself bodily through the Sacrament for the forgiveness of sins receives exactly what Christ desires for him. He receives forgiveness of sins, life, and salvation. He receives all the benefits of Christ’s death on the cross. Christ instituted this meal as His last will and testament as He willingly headed to the cross. In these final moments before His arrest, His thoughts were for His church; for nourishing her and strengthening her through this sacred meal. Thus, the Sacrament of the Altar is necessarily found in the Christian church. A Christian church is recognized as such because Christ’s Supper is found there as He instituted it. God’s holy people cannot be without the Lord’s Supper because through it Christ gives us His body and blood for the forgiveness of sins, for eternal life, and for salvation. You can recognize the true Christian church because they don’t have their own-invented supper, but the Supper of our Lord and Saviour Jesus Christ. Amen. Dear crowd crying out, “Hosanna”: grace, mercy, and peace to you from God the Father and our Lord and Saviour Jesus Christ. Amen. The Triumphal Entry of Jesus into Jerusalem on Palm Sunday was not totally unique. In fact, it wasn’t that different in outward appearance from the entry of others kings before Him. Previous kings of Israel had had similar entries into the city at their coronation. King Solomon rode into Jerusalem on a similar animal: a mule (1 Ki. 1:32 – 40). When King Jehu was anointed, people laid down their cloaks underneath the king (2 Ki. 9:12 – 13). Jesus had the royal privilege of riding on a donkey that had never before been ridden, and was received with loud shouts of people rejoicing and following Him, as people had received other kings of Israel. Palm branches had been used at previous celebrations and times of rejoicing (Lev. 23:40, Neh. 8:13 – 17, 2 Macc. 10:5 – 8), and were now used to celebrate this triumphant king riding into Jerusalem. As Christ entered Jerusalem, did the people really know what triumph they were celebrating or who this king is? Did they really know that they were welcoming God Himself? They shouted, “Hosanna,” meaning “save us!” They called Him the Son of David, and recognized that He is coming in the name of the Lord. The throng was thus openly acclaiming Him as the Messiah, the promised Saviour of the world, and the fulfilment of Old Testament prophecy. However, the crowd misunderstood the King and His kingdom. They did not understand the tension between Jesus the King and Jesus the humble servant. They did not comprehend the reason their King rode a lowly donkey, and even that had to be borrowed, instead of a majestic horse. Nor did they realize that their King did not come to be crowned with a crown of gold, but with a crown of thorns. Anticipating His rise to a royal throne, the crowd did not expect Him to be raised up on a cross. Seeing the royal privilege of riding on a donkey that had never before been ridden, they did not foresee that later that very week, He would have the royal privilege of being buried in a tomb in which no one had yet been laid. The crowd had seen the miracles of Jesus, and it was for this reason that they wanted to crown Him king (Lk. 19:37), as they had attempted to do previously when he had miraculously fed 5000 of them (John 6:15). They were looking for an earthly king, a king that would save them from under Roman rule. They wanted to be free from paying taxes to Caesar. They sought the benefits of being associated with the victorious king, who could miraculously feed them with food for which they did not have to pay, and heal those suffering in their midst. The disciples themselves struggled with this understanding, Peter even took Jesus aside to rebuke Him for saying that He would suffer and die. Jesus responded to Peter “Get behind me, Satan! You are a hindrance to me. For you are not setting your mind on the things of God, but on the things of man (Mt. 16:21 – 23).” Peter was thinking about earthly glory and an earthly kingdom, and his focus on worldly things was a hindrance to the things of God. How often are we like this Palm Sunday crowd? On Sunday morning we worship God, we come to church, we recognize that Jesus is the promised Saviour, but throughout the rest of the week, beginning with Sunday afternoon, we live our lives focused only on worldly things. How often, like the world around us, do we ignore the things of God and only focus on the things of man? Our focus is clouded with the haze of comfort and earthly security. We love life here in this world. We pursue worldly things. We want life to be easy and comfortable, so we chase after comforts and indulge in them to the point of borrowing from our children to pay for them. We want life to be pleasurable, so we lust after the delights of the eye and sacrifice the well-being of our families. We tolerate all sorts of wickedness in our lives, in the lives of our families, in our communities, and in our nation, because we are worried that confronting wickedness will result in our discomfort. We are more concerned with offending our neighbour, which might be uncomfortable, than with offending God who can destroy both body and soul in hell (Mt. 10:28). We too often have our mind fixed on the things of this world, the things that will pass away, instead of on things above, which are eternal. Since we cannot get rid of our sinful nature – our Old Adam – we must daily repent. We must daily drown our sins and evil desires. We must not make provision for the flesh and thus must drown all sins and drown all evil desires. Living in repentance, we thus keep our eyes on the things above. We focus on our new life in Christ, not on the desires of the flesh. We thus have the mind of Christ who made Himself nothing, taking on the form of a servant, and humbled Himself to the point of death, even death on a cross (Phil. 2:5-8). Jesus knew the hearts and minds of the people on Palm Sunday, and He also knows our hearts and minds. Despite the mistaken view these people had of Him and His kingdom, out of His love for them, and out of His love for us, He went on with His mission. He did more than conquer the Romans and save them from paying taxes. He saved them, and He saved us, from the power of death and the devil. He saved them, and He saved us, from our sinful nature. He saved us by suffering. He conquered by dying. His death gives more than freedom from the Romans; Christ’s death gives freedom from sin, death, and the grave. As the crowd on Palm Sunday shouted, “Hosanna,” “save us,” the King of kings did indeed save us. He saved us by becoming our righteousness. As Jeremiah writes, He will be called, “The Lord is our Righteousness (Jer. 23:6).” Before the judgment seat of God we can claim His merits and His righteousness. Christ fulfilled the Law and is righteous, but since He is our righteousness, we are declared righteous, we are declared blameless, we are declared as having fulfilled the Law. Jesus died for your sins, and thus takes them away from you. Not one sin is left out. Jesus atoned for all sin. Jesus is the Lamb of God who takes away the sin of the world. This is the kingdom of the King of kings. This heavenly kingdom is our promised inheritance. So stay awake! Do not fall into spiritual inattentiveness. Do not fall into a life of unrepentant sin, a life of darkness. Jesus has triumphantly entered His kingdom after defeating your enemies, and He prepares a place for you in that kingdom. He has promised to be with you, and to strengthen you during your time here below through Word and Sacrament, until you triumphantly enter the joys of heaven. Because of Christ’s victory on the cross, you have a triumphal entry awaiting you. Amen. Dear people who suffer: grace, mercy, and peace to you from God the Father and our Lord and Saviour Jesus Christ. Amen. The true Christian church, or God’s holy people, is recognized by suffering. Yes, I said suffering. The true church of God is recognized by the fact that she suffers. The other marks of the church are perhaps more understandable. The true church must have God’s Word and the Sacraments instituted by Christ. The church must have men administering Christ’s gifts to His people and people responding in prayer, praise, and thanksgiving. But suffering? Is suffering really a mark of the church? Certainly more popular is the preaching of the theology of glory; that preaching which says that God wants you to be healthy and wealthy; that preaching that says if you have faith, God will give you prosperity and wellness; that preaching which says you can live your dreams now and live your life to the fullest and make it last. After all, Scripture says, “I can do all things through [Christ] who strengthens me.” (Philippians 4:13) Didn’t Christ suffer for me so that I don’t have to suffer? It is true that Christ did suffer for you. He suffered for you so that you won’t suffer eternally in hell. But God’s holy people must suffer misfortune, persecution, tribulation, and evil from the devil, the world, and the flesh. We suffer so that we would be conformed to Christ, our head. The Apostle is suffering in jail, and the Philippian church is concerned for him. Paul writes that he is content even in suffering and in prison, in hunger, and in need because he can do it through Christ who strengthens him. He can face suffering because Christ strengthens him for it. Not quite the stuff of motivational posters. This Scripture passage doesn’t mean that you can become a professional ball player because Christ strengthens you to do it. It doesn’t mean you can scale Mount Kilimanjaro because Christ will strengthen you. It doesn’t mean you will be the top salesman in your office because Christ strengthens you. Christ has never promised these things to you or to anyone else. It means that you can be content even in suffering and in prison, in hunger, and in need because you can do it through Christ who strengthens you. You can face suffering because Christ strengthens you for it. Until Christ returns, the church of God will suffer at the hands of the devil, the world, and our flesh. The devil will not stop harassing and persecuting God’s people. He will not stop prowling around like a roaring lion, seeking to devour us. He will not stop causing strife and contention. He will not stop twisting God’s Word. He will not stop his temptations. The devil is the sworn enemy of Christ, our head, so he is the sworn enemy of us, the body of Christ. The world will not stop its persecutions and attacks against the church. The world hates Christ’s holy people because the world hates Christ. Jesus says, “If the world hates you, know that it has hated me before it hated you. If you were of the world, the world would love you as its own; but because you are not of the world, but I chose you out of the world, therefore the world hates you. Remember the word that I said to you: ‘A servant is not greater than his master.’ If they persecuted me, they will also persecute you. If they kept my word, they will also keep yours. But all these things they will do to you on account of my name, because they do not know him who sent me.” (John 15:18-21) The world will only stop hating us if we conform to the world and cease being God’s holy people. Our sinful flesh will not stop its attacks and temptations either. Our flesh will not stop wanting things that are opposed to God’s will and commands. Our flesh will not stop its desires to conform to the world so that we would not have to face suffering. Our flesh will not stop desiring to jump headfirst into every temptation the devil and the world dangle before us. No, this does not mean that suffering is pleasant, but suffering for the sake of the Gospel is an honour for Christians, who know that our Saviour suffered for us. This suffering tests the genuineness of our faith (I Peter 1:7) and helps kill our sinful flesh so that we might learn patience, humility, meekness, praise, thanksgiving, and gladness. We can rejoice in our suffering because it is momentary and not worth comparing with the glory that is to be revealed to us (Rom. 8:18). Suffering keeps us ever clinging to the cross of Christ. It pulls us away from worldly desires and gives us a desire to be with our Saviour in heaven. It crushes out idols and leads us to cling to the free forgiveness which Christ has earned for us. Suffering draws us to the Gospel and leads us to cling to the sacraments where Christ has promised to give us the medicine of eternal life. It is a mark of the true Christian church that she suffers as Christ her Lord suffered. Where the devil, the world, and the sinful flesh are attacking, tempting, and persecuting, there must be the true Christian church; there must be God’s holy people. Where people suffer for the name of Christ and for the sake of the Gospel, there is God’s holy people; there is the true Christian church. Amen.